Phil you are the man buddy. Thank you for such great work! As usual thanks for the great tips. I have a question, I am noticing some places with as much as 8 categories. Do you know how they are accomplishing this when Google only gives you 5 boxes. Thanks for the overly kind compliment! Great question. Google scrapes those other categories from third-party sites (like InsiderPages, Citysearch, etc). As far as I’ve been able to tell, Google extracts those categories from keywords that it finds in the descriptions and reviews that you have on these third-party sites, the categories that you’re listed under on those sites, and *possibly* from the “keywords” or “tags” fields that those sites usually feature. Just the fact that these extra categories show up on your Places page is reason enough to take the time to provide as much info as the third-party sites allow you to; it can be a nice way to snag those extra categories. Great post as always Phil! You said to read the guidelines but one category guideline most people miss is what I can the “Is not Does” rule. I had my 1st call a couple months ago from someone who was suspended for violating it. She was a Dentist. Was not doing anything spammy. Had all the normal cats Dentists have like Cosmetic Dentistry, Dental Implants, Teeth Whitening. She got suspended and G told her it was for violating the “Is not Does” rule. But even before that, as soon as it was added to the guidelines I started teaching in my classes how to avoided breaking that rule, because I was afraid she’s start penalizing for it – and she did! However that’s the only case I’ve heard of that got a penalty. I couldn’t agree more about how it’s worth paying special attention to that one. 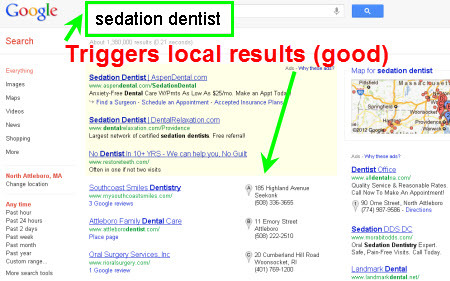 I have a dentist client who’s #1 in a fairly large city for the major terms (plus more specialized ones), and for him I basically chose the exact same categories you described, except I went with “Implant Dentist,” “Teeth Whitening Service,” etc., so as to stay within the boundaries of “is.” The differences are often so trivial. My money says you got your client right back on the map, but I imagine she serves as a pretty good real-life story to cite when you’re telling people that, no, they really do need to sweat the details. After a bit of research I finally realized I had it almost right to begin with. Very helpful article, though. Right on – every little bit counts! Can you elaborate more on the “is not does” rule? In a nutshell, it means the words you use to create custom categories should be words that describe your *business itself*, rather than your services. I’m sure you read the Quality guidelines and read Linda’s and my comment on this, so no use in my rehashing any of those. Again, this is only something you have to worry about when specifying custom categories (as opposed to when you’re choosing them from Google’s list). Great post and it is good to see someone blogging about something fairly small that will have significant impact on your local search. No matter what niche I am looking at you see that people (I presume both businesses and SEOs) just dont really spend any time investigating what business categories they should be using…this impacts your Local SEO directly and needs time spending on it. #3 – Mike’s cool little tool is hidden away and I suspect underused – I have found it a godsend. #5 – Competitor research is essential, but always take it with a pinch of salt. Use the data wisely! #11 – Great point and one that a lot of people seem to miss. Research before optimising a Places page can save you a lot of work down the line! #13 – I think this is your most important point, check with colleagues, check with clients and check with customers! Thanks for your compliments and for the awesome insights! I really like your point about taking keyword data with a “pinch of salt”; that’s a great way to put it, and it explains probably 90% of the problems people get themselves into with custom categories in particular. Your content is always a main course and never just an appetizer! clarification on the IS Does Issue. Good stuff!! Thanks! I appreciate the compliments! I’d definitely be interested in what you think would make for awesome posts to do next – something you’d personally find useful. Great post Phil, categories are always underrated! As a quick tip for #5 you can use LocalSearchToolKit.com to quickly analyze across several keywords which categories are the most popular among the ranking businesses. Thanks for the feedback! I agree: categories sure don’t get enough of the local-search limelight. I’ll include a line about LSTK. Good call. Actually, Tony from SpottedKoi.com told me about it some time ago–I believe while it was still in the works–but I hadn’t given it a good hard look since (until now). point no. 6 about “first 3 categories”. this is smart. Nice post. Thanks for saying so! I actually didn’t think of that until I sat down to write the post. The only caveat to point #6 is that sometimes Google will scrape search terms from third-party sources and put them at the beginning of your “Categories” area (kind of like how Google picks “At a glance” snippets). So it’s possible to have random categories that you did NOT pick showing up in those first 3 category spots. I don’t know of any way to prevent this, but it isn’t too common, so it’s hardly worth mentioning. Great article – you alway provide phenomenal insight. Would appreciate your help — when I search Toronto Marketing Company, Toronto Marketing Companies or Marketing Companies Toronto – no GP listing is shown. Only PPC and websites. I appreciate the compliments, Maureen – thanks! There’s not much anyone can do about whether the GP results are shown for a particular search term. You probably aren’t doing anything wrong. It may be temporary: sometimes the GP results just stop showing, and only organic results show for a little while, and then the GP results come back a little while later. 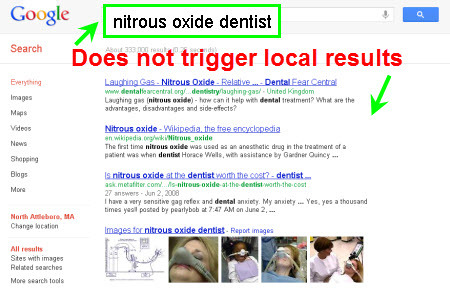 But it’s more likely at least semi-permanent: Google just doesn’t show GP results for some of the types of search terms it used to. Nothing we can do about that, obviously. 1. Type in those search terms, then click on the “Maps” tab. How visible are you there? At least this will tell you if you have some more optimization work to do. If it’s the case that there’s room for improvement, once you make some changes you might get visible for terms other than “Toronto marketing company.” The most important thing is to make sure you’re leaving no stone unturned, in terms of optimization. 2. Now would also be the time to beef up your listings on third-party sites and especially to get customer reviews there, if you haven’t already. This is part of what I’m referring to in item #1, but it’s worth emphasizing. As you know, those sites tend to show up highly in organic search, and some subset of your potential clients will click on those. If/when they do, it’s worth showing up as highly as possible and/or sticking out as much as you can by having more reviews than the next guy or gal. The upshot of this, of course, is all of this helps your GP rankings (for whatever terms do trigger the GP results). 3. If GP simply seems to be a dead-end for now – at least for the specific search terms you mentioned – I’d set up a PPC campaign; go heavy on the geographical targeting, make sure you’ve set up location extensions, etc. You probably have the Adwords chops for this, but obviously Adwords Express is also an option (though it’s certainly not my first choice, personally). Are they synonymous to Google? Should I change my citations that have an and in the name to &? My guess is the ampersand snuck in there from third-party sources. Sometimes the BIG, important data-sources like InfoGroup (ExpressUpdateUSA) and LocalEze will take liberties with your formatting. In a roundabout way, those can get fed into Google Places, sometimes overriding the “and” you put in your name. If you’re absolutely determined to have the “and” (not the ampersand) appear universally, do a GetListed.org scan, go to the “Accuracy” tab, and make sure you tweak as many of the sites that use the ampersand as you can. That’s the best way to get it to stick, although some of the sites are rigid about formatting. If you don’t care as much about the ampersand as you do about just having everything be consistent, it would probably be a little easier just for you to switch your GP listing (and any third-party sites) to the ampersand. You’ll probably have to re-verify, though that shouldn’t mess up your rankings. But, to some extent, you can’t avoid discrepancies, because these sites all have their different little rules, preferences, and quirks. If you write “Street” on some of these sites, they’ll just change it over to “St.” There’s no way to get the “St.” versus “Street” inconsistencies completely resolved, but I just haven’t found that it matters. As long as you’re using one of those two standard formats, Google will be able to digest the third-party info just fine (if you do something funky like “Strt,” that might be a problem). So, it would be ideal to get all the sites to use the “and” or the ampersand (doesn’t really matter which), but it will take a little time. If you don’t reach perfect consistency, that’s OK; it shouldn’t hurt your rankings. I’d start with LocalEze and ExpressUpdateUSA. Wouldn’t worry about “St.” versus “Street,” though. GP rankings constantly are being shuffled around, so there’s not really a fixed “update schedule” or anything. But, just in my experience, I’ve found that the rankings in semi-competitive markets (as opposed to stagnant ones where nobody cares about GP) usually get shaken up once about every 2-4 weeks. As for your competitors, I suggest you just keep doing what you’re doing. If you have any line of communication with your more-ethical competitors—the ones who are honest about their addresses—maybe let them know what’s going on (if they don’t know already) and ask them to join you in reporting the problem to Google. Maybe also get a couple employees/friends/family to do the same. Still, there’s no guarantee Google will do anything—in a timely manner or at all—t it’s pretty much a sure thing your competitors will get by with it if you don’t. Thank you so much for the valuable information. I just have one question: is it really possible to list a blog as a business ? and if yes, what is the relevant category to choose from ?